Vendor Status as "Sole Source"
Some purchases are allowable outside of the competitive bidding requirement due to the fact that the providing vendor is the only source for the item(s). Being a “sole source” vendor is outlined below and will need to be confirmed in writing from the vendor to the purchasing office to include items for which the vendor is the only source. If the item or intended purchase does not qualify under one of the specific exceptions listed below it is not a single or sole source item(s) and the competitive bidding requirements will apply. Click here for the sole source compliance letter. Sole source confirmations may be e-mailed to WitcheM@hpisd.org ensuring that there is an authorized signature and date for our records, faxed to the attention of Mary B. Witcher to (214) 780-3026 or mailed to the Purchasing Department, 7015 Westchester Drive, Dallas, TX 75205. 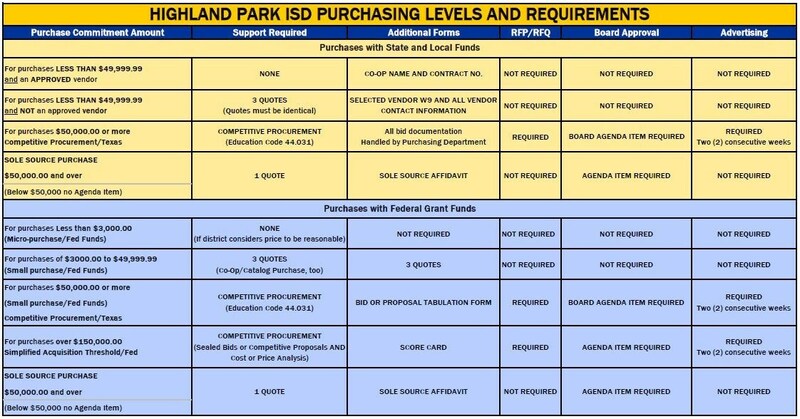 Below is the definition of a “sole source” vendor as defined by the Texas Education Code. Vendors submitting confirmation of their sole source status should understand they are agreeing to being in compliance with the below information.